The parent company of Tower Records, the pioneering record merchant that invented the music megastore and became one of the nation's largest music and video retailers, has filed for bankruptcy, the company announced Monday. MTS Inc., the privately held parent of the West Sacramento-based chain, said it has filed a prepackaged plan of reorganization and voluntary petitions for reorganization under Chapter 11 as the concluding step in a debt restructuring that began in May 2003. The company filed in U.S Bankruptcy Court in Wilmington, Del., the day after the record industry celebrated itself with the Grammy Awards. 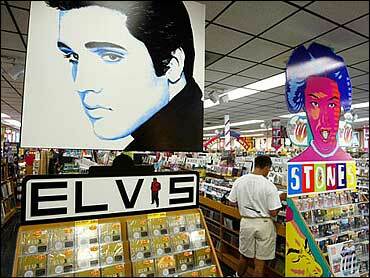 Analysts said other music retailers are suffering as well. "Sam Goody has been closing stores," said music attorney Jerry Reisman of Garden City, N.Y. "They suffer from some of the same pains that Tower Records suffers from. Virgin may not be in that much trouble, but I will tell you, Virgin, too, is having difficulty competing just on the sale of music." Reisman cited record piracy as a major factor in music retailing's demise, saying, "The person who is buying CDs, the predominant person is teenagers who shopped in the past at stores such as Tower, and they are no longer shopping at Tower. They are taking the music online without having to pay for it." Court approval of the bankruptcy plan will cut existing debt by $80 million, Tower CEO E. Allen Rodriguez said in a news release, and will eliminate "the financial risks that have faced Tower for the past three years. Our issues are financial, not operational ... and we expect the prepackaged reorganization to be concluded quickly." The company said it expects to receive plan confirmation and successfully complete the reorganization within 60 days. The filing comes nearly a year after MTS decided to sell Tower because it could not make a $5.2 million payment on its debt. Los Angeles investment banker Lloyd Greif, hired to sell the company, said his firm is still talking with interested buyers, but selling the company has proved more difficult than he expected. The bankruptcy filing proposes that creditors assume shares of Tower Records in exchange for their debt holdings. Presently, Russ Solomon, who launched the chain with a single store in Sacramento in 1960, holds 62 percent of the privately held company, with his two sons, Michael and David, who hold another 36 percent. The chain's creditors include 38 bondholders such as AIG Investment Group, Bear Stearns Securities Corp., JP Morgan Chase and Morgan Stanley & Co. Inc.
Tower will continue to operate as normal during the Chapter 11 process, paying its employees, honoring customers' gift certificates and paying its vendors, the company said in a statement. The reorganization plan also calls for repaying millions of dollars owed to vendors that have supplied the chain with compact discs, videos and books. According to documents filed Monday, those obligations include $15.6 million to Universal Music and Video, $13.6 million to WEA Distribution (Warner, Elektra and Atlantic Records), $7.1 million to Sony Music Entertainment and $7.1 million to BMG Distribution. Founder Solomon and Tower Records became a cultural icon nationally in the music business, known for in-store concerts and a deep selection of up to 180,000 titles in its largest stores.